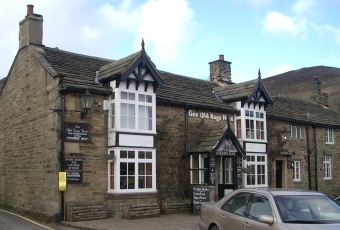 Classic Hikers pub - marking the start of the Pennine Way and being in perfect walking country. Very quiet at Lunch on a Friday but it fills up as the afternoon goes on. Classic pub of its type but needed a fire. The Hikers Bar was cold and the Black Sheep freezing! We stayed at coopers farm...great couple of night..we had a meal at The Nags Head...nothing special if honest...my all day breakfast in a can in the morning was far tasty...but anyway, wr decided to watch the final of the world cup as advertised outside the pub that it would be showing the game, we was really looking forward to the match as my partner had watched nearly every game,there was a good crowd in the pub lots of beer being drunk lots of money spent, germany won then it was the medal ceremony started everyone was getting excited ...then darkness the television was switched off, I couldnt believe it i said to a waitress what has happen she held her hands up and said nothing to do with me...then a blonde haired woman from behond the bar said times up time to go...but there was two men playing pool and three men still drinking beer... I said to her you are unbeieveable...its the world cup....she just mocked me with "yes unbelieveable" why advertise you are showing a game take the rewards of the evening ie customers drinking money, and not show the end of the match, I was so annoyed with her and gutted for my partner I just had to walk away from the situation I am still really annoyed with what went on...i am writing to the brewery about this matter believe me and i will be commenting on as many reviews i can..
A decent pub with 4 casks available. Worth a visit. Probably the worst pub of my recent jaunt in the Peak. Beers OK, service OK. Used to go in here on my first trips to the area in the late 80s - and was the first place I ever had Old Peculier (a beer that changed my drinking habits to become the real ale drinker that I am now). Now there's just a couple of mediocrely kept beers - one being the watered-down imitation of the great beer that was Old Speckled Hen. Shame, was quite looking forward to returning. Reasonable selection of cask ales. Shocking selection of food of questionable quality. Probably best for a ramblers quick pint on the way back to Edale train station.